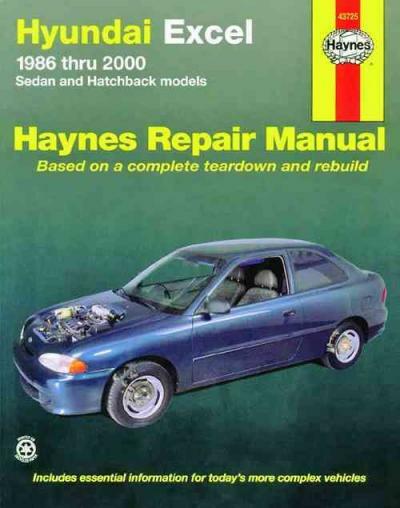 Hyundai Excel 1986 - 2000 Haynes Owners Service & Repair Manual covers: Hyundai Excel models from 1986 to 2000 (X1, X2 and X3 generation), both sedan and hatchback (3-door, 4-door and 5-door models). The Hyundai Excel sometimes known because the Hyundai Pony, Hyundai Presto as well as the Mitsubishi Precis, was the initial front wheel drive auto yielded by Hyundai. The Excel was built from 1985 with 1994. The Excel range changed Hyundai's back wheel drive Hyundai Pony however, the Excel was available beneath the Pony name inside several markets - any front wheel drive Pony is an Excel. The Hyundai Excel, sometimes known because the Hyundai Pony, Hyundai Presto as well as the Mitsubishi Precis, was the initial front wheel drive vehicle yielded by Hyundai. The Excel was built from 1985 with 1994. The Excel range changed Hyundai's back wheel drive Hyundai Pony however the Excel was available below the Pony name inside certain markets - any front wheel drive Pony is an Excel. A subcompact automobile is the American expression for an vehicle with a class size small than a compact auto, normally not exceeding 165 inches inside size, nevertheless bigger than a microcar. According with the United States Environmental Protection Agency, a passenger automobile is categorized because subcompact when it has between 85 cubic feet plus 99 cu ft of inside amount. The subcompact segment equates about with A-segment plus B-segment inside Europe, or city vehicle plus supermini inside British terminology. In 2012, the NY Times described the variations, suggesting "todayÃ¢Â€Â�s tiny vehicles really span 3 leading segments inside the worldwide car marketplace. The tiny A-segment vehicles include the Chevrolet Spark plus Smart Fortwo. TheyÃ¢Â€Â�re very brief plus extremely light. Slightly bigger are B-segment vehicles like the Ford Fiesta plus Chevrolet Sonic. The Hyundai Excel was obtainable in hatchback plus 4-door models. Originally, the Excel was expected to be changed by the Elantra inside 1990, however was available for 4 more seasons till being changed by the Hyundai Accent inside 1994. The Excel was the initial Hyundai vehicle with be exported with the United States. From 1990, there was clearly a coupe variant called the Hyundai Scoupe, that was changed by the Hyundai Coupe inside 1996. The Hyundai Excel was accessible with either a guide or automatic transmission mated with a 4-cylinder engine aspirated with a carburetor or gas injection program, depending about marketplace plus model year. Many markets, including Europe, had the Excel branded because the Hyundai Pony, though it is very not straight connected with the back wheel drive Hyundai Pony within the early 1980s. In South Korea the Hatchback adaptation of the X-CAR was well-known as Hyundai Pony Excel, as well as the sedan variation was recognised as Hyundai Presto. The Excel was additionally available inside the United States by Mitsubishi Motors from 1987 with 1994 because the badge designed Mitsubishi Precis. Available because either a 3- or 5-door hatchback, the Precis stayed inside the Mitsubishi range because a "cost leader," slotted under the Mirage till it was discontinued inside 1992. Fuel injection is a program for admitting gas into an internal combustion engine. It has become the main gas delivery program employed inside automotive motors, having changed carburetors throughout the 1980s plus 1990s. A range of injection systems have existed because the earliest use of the internal combustion engine. The main difference between carburetors plus gas injection is the fact that gas injection atomizes the gas by forcibly pumping it by the little nozzle below excellent stress, when a carburetor relies about suction produced by intake air accelerated by the Venturi tube with draw the gas into the airstream. Modern gas injection systems are made especially for the kind of gas being utilized. Some systems are created for several grades of gas. Most gas injection systems are for gasoline or diesel applications. The initially commercial electronic gas injection program was Electrojector, developed by the Bendix Corporation plus was available from American Motors Corporation inside 1957. The Rambler Rebel, showcased AMC's brand-new 327 cu inside engine. The Electrojector was an alternative plus rated at 288 bhp. The EFI yielded peak torque 500 rpm lower than the similar carburetored engine The Rebel Owners Manual described the shape plus surgery of the unique program.. The expense of the EFI way was US5 plus it was accessible about 15 June 1957. Electrojector's teething difficulties meant just pre-production vehicles were thus equipped: therefore, few vehicles thus equipped were ever available plus none were prepared accessible with the public. The EFI program inside the Rambler ran fine inside warm weather, however, suffered difficult beginning inside cooler temperatures. Chrysler available Electrojector found on the 1958 Chrysler 300D, DeSoto Adventurer, Dodge D-500 plus Plymouth Fury, arguably the initial series-production vehicles built with an EFI program. It was jointly designed by Chrysler plus Bendix. The early electronic components were not equal with the rigors of underhood service, but, plus were too slow with maintain with all the demands of "found on the fly" engine control. Most of the 35 cars initially thus equipped were field-retrofitted with 4-barrel carburetors. The Electrojector patents were subsequently available with Bosch. Bosch developed an electronic gas injection program, called D-Jetronic, that was initially employed found on the VW 1600TL/E inside 1967. This became a speed/density program, utilizing engine speed plus intake manifold air density with calculate "air mass" flow rate and therefore gas needs. This program was adopted by VW, Mercedes-Benz, Porsche, CitroÃ�Â«n, Saab, plus Volvo. Lucas certified the program for creation with Jaguar. Bosch superseded the D-Jetronic program with all the K-Jetronic plus L-Jetronic systems for 1974, though certain vehicles continued utilizing D-Jetronic for the following years. In 1970, the Isuzu 117 CoupÃ�Â© was introduced with a Bosch-supplied D-Jetronic gas injected engine available just inside Japan. In Japan, the Toyota Celica utilized electronic, multi-port gas injection inside the optional 18R-E engine inside January 1974. Nissan available electronic, multi-port gas injection inside 1975 with all the Bosch L-Jetronic program utilized inside the Nissan L28E engine plus installed inside the Nissan Fairlady Z, Nissan Cedric, as well as the Nissan Gloria. Nissan additionally installed multi-point gas injection inside the Nissan Y44 V8 engine inside the Nissan President. Toyota shortly followed with all the same development inside 1978 found on the 4M-E engine installed inside the Toyota Crown, the Toyota Supra, as well as the Toyota Mark II. In the 1980s, the Isuzu Piazza, as well as the Mitsubishi Starion added gas injection because standard equipment, developed individually with both firms history of diesel driven motors. 1981 saw Mazda provide gas injection inside the Mazda Luce with all the Mazda FE engine, plus inside 1983, Subaru available gas injection inside the Subaru EA81 engine installed inside the Subaru Leone. Honda followed inside 1984 with their own program, called PGM-FI inside the Honda Accord, as well as the Honda Vigor utilizing the Honda ES3 engine. The limited manufacturing Chevrolet Cosworth Vega was introduced inside March 1975 utilizing a Bendix EFI program with pulse-time manifold injection, 4 injector valves, an electronic control device, five independent sensors plus 2 gas pumps. The EFI program was developed with meet stringent emission control needs plus marketplace demands for a technologically advanced sensitive car. 5000 hand-built Cosworth Vega machines were yielded yet just 3,508 vehicles were available by 1976. The Cadillac Seville was introduced inside 1975 with an EFI program produced by Bendix plus modelled really carefully about Bosch's D-Jetronic. L-Jetronic initially appeared found on the 1974 Porsche 914, plus utilizes a mechanical airflow meter which produces a signal which is proportional with "air volume". This approach necessary more sensors with measure the atmospheric stress plus temperature, with eventually calculate "air mass". L-Jetronic was generally adopted about European vehicles of which period, along with a some Japanese models a brief time later. In 1980, Motorola introduced the initially electronic engine control device, the EEC-III. Its integrated control of engine functions is today the standard approach for gas injection systems. The Motorola development was installed inside Ford North American goods. The Excel was introduced because a substitution for the Hyundai Pony. In the United States it was the company's initial plus just model, however because of a cost of ,995 USD plus being voted 'Best Product #10' by Fortune magazine, it set records for a first-year import by marketing 168,882 units, assisting drive the company's cumulative creation past 1 million by 1986. Similar sales achievement was replicated inside Australia, where it was priced at A,990. Sales shortly dropped because severe standard difficulties appeared with all the vehicle. From 1991, the 1.5 versions were badged 1.5i with denote gas injection. The 5 door model will have been obtainable in Canada for a longer period plus inside a wider range of trims. The Mitsubishi Precis came because a 3 door just, inside trim degrees equal with the base plus GL Hyundai-branded vehicles. Conventionally, inside purchase with choose the transmission running mode, the driver moves a selection lever found either found on the steering column or found on the floor. In purchase with choose methods, or with manually choose certain gear ratios, the driver should drive a switch inside or pull the handle out. Many cars position selector buttons for every mode found on the cockpit rather, freeing up room found on the central system. Vehicles conforming with US Government guidelines need the methods ordered P-R-N-D-L. Before this, quadrant-selected automatic transmissions usually chosen a P-N-D-L-R design, or synonymous. Such a pattern led with a quantity of deaths plus injuries owing with driver mistake causing unintentional gear selection, plus the risk of getting a selector jump into Reverse from Lower gear throughout engine braking maneuvers. This selection mechanically locks the output shaft of transmission, restricting the car from moving in almost any way. A parking pawl prevents the transmission from rotating, plus consequently the car from moving. But, it ought to be noted which the vehicle's non-driven wheels continue to be free with turn, as well as the driven wheels might nevertheless turn individually. For this cause, it's suggested with employ the hand brake considering this really locks the wheels plus prevents them from moving. It is typical of front-wheel-drive cars for the parking brake with lock the back wheels, thus utilize of both the parking brake as well as the transmission park lock offers the best safety against unintended movement about slopes. This also increases the lifetime of the transmission as well as the park pin system, considering parking about an incline with all the transmission inside park without the parking brake involved may result undue strain found on the parking pin, plus can even avoid the pin from releasing. A hand brake could equally avoid the vehicle from moving when a used selector accidentally drops into reverse gear when idling. A auto ought to be authorized with come with a complete stop before setting the transmission into park with avoid damage. Usually, Park is regarded as just 2 choices inside that the car's engine is began, the alternative being Neutral. This really is usually accomplished through a usually open inhibitor switch wired inside series with all the starter engine engagement circuit, that is shut whenever P or N is chosen, completing the circuit. In several contemporary vehicles plus pickups, the driver need the foot brake used before the transmission is taken from park. The Park position is omitted about buses/coaches with automatic transmission, that should rather be located inside neutral with all the air-operated parking brakes set. This engages reverse gear in the transmission, permitting the car with be driven backward, plus operates a switch with start the white backup lights for improved awareness. To select reverse inside many transmissions, the driver should come with a complete stop, depress the shift lock switch plus select reverse. Not coming with a complete stop might result serious damage with the transmission. Many contemporary automatic transmissions have a protection system inside destination, that does, with several extent, avoid inadvertently placing the vehicle inside reverse whenever the car is moving forward; these a device might comprise of the solenoid-controlled bodily barrier about either side of the Reverse position, electronically involved with a switch found on the brake pedal. Therefore, the brake pedal should be depressed inside purchase with permit the selection of reverse. Some electronic transmissions avoid or delay engagement of reverse gear completely when the auto is moving. Many shifters with a shift switch permit the driver with freely move the shifter from R with N or D without really depressing the switch. But, the driver cannot shift back with R without depressing the shift switch, with avoid accidental shifting that might damage the transmission, particularly at excellent speeds. This disengages all gear trains in the transmission, effectively disconnecting the transmission within the driven wheels, permitting the car with coastline freely beneath its own fat plus gain momentum without the motive force within the engine. Coasting in idle down lengthy grades ought to be prevented, though, because the transmission's lubrication pump is driven by non-idle engine RPMs. Similarly, emergency towing with an automatic transmission inside neutral ought to be a last resort. Manufacturers recognize emergency instances plus list restrictions of towing a car inside neutral. This really is truly the only additional selection inside that the vehicle's engine can be began. This position enables the transmission with engage the full range of accessible forward gear ratios, permitting the car with move forward plus accelerate by its range of gears. The amount of gear ratios in the transmission depends found on the model, even so they initially ranged from 3, with 4 plus five speeds. Six-speed automatic transmissions are the most usual providing inside vehicles plus pickups from 2010 inside carmakers because Toyota, GM plus Ford. However, seven-speed automatics are becoming obtainable in certain high-performance creation deluxe vehicles, because are eight-speed autos inside models from 2006 introduced by Aisin Seiki Co. inside Lexus, ZF plus Hyundai Motor Company. From 2013 are accessible 9 speeds transmissions yielded by ZF plus Mercedes 9G. The Hyundai Accent , or Hyundai Verna ) inside South Korea, is a subcompact vehicle yielded by Hyundai. In Australia, the initial generation models carried over the Hyundai Excel name utilized by the Accent's predecessor. The Accent was changed inside 2000 by the Hyundai Verna inside South Korea, though many global markets retained the "Accent" name. The Hyundai Verna is advertised inside the USA because the Hyundai Accent. The Accent is yielded for the Chinese marketplace by Beijing Hyundai Co., a joint venture with Beijing Automotive Industry Corp. For Russian marketplace it really is assembled by TagAZ plant inside Taganrog. In Mexico, the Accent is advertised by Chrysler because the Dodge Attitude, earlier Verna by Dodge. In Venezuela, Chrysler advertised them because Dodge Brisa till 2006. The Brisa was assembled by Mitsubishi Motors at its plant inside Barcelona, Venezuela. Because 2002, the Accent had been the longest-running tiny family vehicle available inside North America. In Puerto Rico, it was available because the Hyundai Brio. In Russia, where the 4th generation Accent became the best-selling vehicle available inside 2011, it is actually available because the Hyundai Solaris. In 2008, Hyundai Accent was called the many dependable sub-compact automobile by J.D. Power plus Associates.